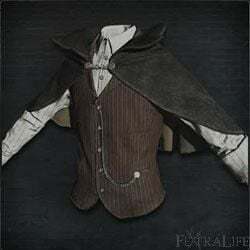 Foreign Garb is a Chest Armor (Attire) in Bloodborne. It is part of the Foreign Set. "Clothing worn upon awakening to the nightmare of blood and beasts. Not typical clothing for Yharnam, perhaps it is of foreign origin. It is said, after all, the traveler came to Yharnam from afar. Without memory, who will ever know?" Low resistance starting equipment. Has notably worse protection stats than almost all other armor, should be replaced by the first substitute the player finds. I didn&apos;t like this set. I thought it was kinda of ugly. Especially the pants. I sold this far to fast to buy the hunter gear first time I was sent to the hunters dream. I didn&apos;t have enough money for the pants. I spent a decent amount of time without pants. This attire needs to be added to either the Messengers or Insight Messengers to buy. It seems a lot of people, including myself, sold this early on without realizing there is only the one set.